A Soyuz capsule carrying three space station crew members landed on March 15. A Soyuz spacecraft has safely landed on the frigid steppes of Kazakhstan, returning an American astronaut and two Russian cosmonaut to Earth after a nearly five-month mission to the International Space Station. The Soyuz space capsule touched down at about 11:11 p.m. EDT (0311 March 16 GMT) on Friday (March 15), though it was early Saturday local time at the landing site. The spacecraft returned NASA astronaut Kevin Ford and Russian cosmonauts Oleg Novitskiy and Evgeny Tarelkin home after 142 days in space. 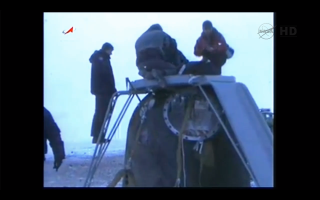 The trio was greeted by freezing temperatures after exiting the spacecraft. "They've landed. Expedition 34 is back on Earth," NASA spokesperson Rob Navias said during live commentary. Originally, the international crew was set to depart from the laboratory on Thursday (March 14), but freezing rain and foggy weather on the ground prevented them from returning home. Weather conditions improved today, leading to a smooth undocking, however a bank of clouds greatly hampered visibility in the landing zone. The foggy conditions caused some last-minute alterations to the original search plan after landing, however, the Soyuz crew was still recovered successfully. This NASA graphic depicts the landing site in Kazakhstan for NASA astronaut Kevin Ford and Russian cosmonauts Oleg Novitskiy and Evgeny Tarelkin, the Expedition 34 crew, who were returning to Earth on March 15, 2013. The three crewmembers were on board to see the docking of the unmanned Dragon capsule — owned and operated by private spaceflight firm SpaceX — at the beginning of March. A month before, the crew participated in the docking and undocking of another supply capsule, the Progress 50. Ford, Novitskiy and Tarelkin leave three other international crewmembers on board the space station. Canadian astronaut Chris Hadfield, Russian cosmonaut Roman Romanenko and NASA astronaut Tom Marshburn remained on board the station after saying goodbye to the three spaceflyers that boarded the space capsule earlier today. Hadfield, Romanenko and Marshburn will not be the sole residents of the station for long. Cosmonauts Pavel Vinogradov, Alexander Misurkin and NASA astronaut Chris Cassidy are expected to arrive at the station on the same day of their launch from Earth on March 28. If all goes as planned, it will mark the first time a Soyuz capsule has delivered a station crew to the International Space Station in one day. Russia's Federal Space Agency has proven the one-day flight profile during unmanned Progress cargo ship deliveries to the space station. NASA has relied on Russia's Soyuz crafts to transport astronauts to and from low-Earth orbit since the retirement of the agency's shuttle program in 2011. NASA officials hope to eventually depend on privately built, unmanned and crewed spacecraft to bring people and cargo to and from the space station. The $100 billion laboratory was built by space agencies representing Japan, Canada, the United States and Russia. International crews of astronauts have continually occupied the station since 2000. This story was updated to reflect a successful landing at 11:42 EDT.